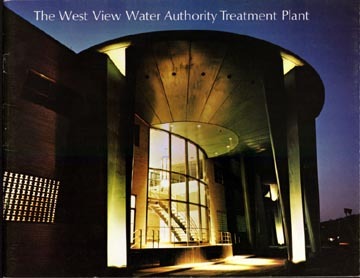 West View Water Authority is located in West View, Pennsylvania and supplies water to 32 municipalities and over 200,000 people in portions of Allegheny, Beaver and Butler counties of Pennsylvania. The Water Treatment Plant is located on Neville Island with the main source of supply from the Ohio River and wells on Davis Island. Wells are maintained and used in the event of an emergency to augment the water supply. Granular activated carbon is used in the treatment process and the water quality meets or exceeds all local, state and federal regulatory standards. The Treatment Plant is capable of treating and pumping 40 million gallons of water a day. Most of the communities served are residential in nature. The Authority owns and maintains 10 reservoirs throughout the service territory with a maximum water storage capacity of 39,850,000 gallons. Avalon Borough, Bellevue Borough, Ben Avon, Ben Avon Heights, Bradford Woods, Emsworth Borough, Franklin Park, Kennedy Township, Kilbuck Township, Marshall Township, McCandless Township, McKees Rocks Borough, Ohio Township, Pine Township, Ross Township, Sewickley Hills Borough, Stowe Township, West View Borough and the 28th Ward of the City of Pittsburgh. Sections of the following communities: Adams Township, Cranberry Township, Economy Borough, Reserve Township, Robinson Township, Sewickley Heights Borough, Sewickley Hills Borough and Shaler Township.